The U.S. House of Representatives Committee on Ways and Means Subcommittee on Oversight held a hearing on October 7, on the rising costs of higher education and the possible role of the nation’s tax policies. 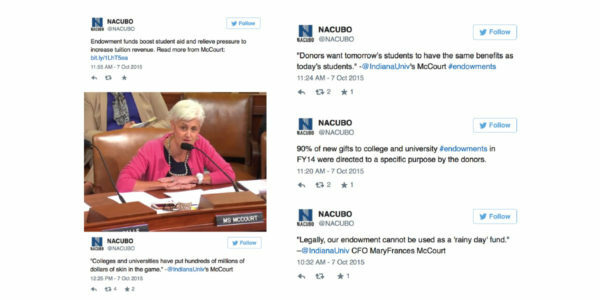 NACUBO was invited to testify on the role of college and university endowments; and MaryFrances McCourt, senior vice president and chief financial officer, Indiana University, Bloomington, served as the association’s witness at the hearing. “Today we’re here to look at what’s behind the rising cost of college, and to consider whether this nation’s tax policies are partly to blame,” said Subcommittee Chairman Peter J. Roskam (R–IL) in his opening statement. Roskam also raised the idea—made popular in 1987 by former Secretary of Education Bill Bennett—that increases in federal financial aid allow colleges to raise their tuition rates; this concept is known as the Bennett Hypothesis. At the hearing, the subcommittee asked that NACUBO discuss college and university endowments, to help lawmakers and the general public gain a better understanding of how endowments are designed to work; how much spending comes from endowments; and the purposes to which those withdrawals are applied. In recent months, along with a continued focus on student debt levels and college costs, public attention also turned to college and university endowments, and critical opinion pieces have appeared in the national media. The other witnesses at the hearing were David Lucca, research officer, Federal Reserve Bank of New York; Richard Vedder, distinguished professor of economics, Ohio University, Athens; Brian Galle, professor of law, Georgetown University, Washington, D.C.; and Terry Hartle, senior vice president, American Council on Education. “College presidents understand the importance of this issue and the extraordinarily high levels of public concern,” Hartle noted in his opening statement. He stressed the impact of steep cuts in states’ operating support for public higher education, as well as three other important cost drivers for institutions of higher education: labor, technology, and government regulation. Other Republican lawmakers at the hearing pointed out that, since endowments enjoy tax-exempt status and the donations they receive are deductible, there is a question as to whether institutions are doing enough to keep costs down and to provide tuition relief. During the two-hour hearing, significant discussion centered on the Bennett Hypothesis. A recent Federal Reserve Bank of New York draft report—of which Lucca is a co-author—draws some conclusions in support of the theory. Hartle, however, disputed the report’s findings because it looks at sticker price versus net tuition and state funding, and did not factor in consideration of the substantial declines in state support as drivers of tuition prices. NACUBO expects lawmakers to continue to put a spotlight on colleges and universities in the coming months. McCourt readily and confidently responded to concerns raised at the hearing with clear information about institutions’ investment in students. As public scrutiny persists, chief business officers should be prepared to tell the story of their efforts to find cost efficiencies and stretch resources and the “skin in the game” that their colleges and universities already invest in their students. In the mid-1980s, state operating appropriation made up 58 percent of the general education fund budget, and tuition and fees made up 26 percent. NACUBO shared real-time highlights on its Twitter account (@NACUBO).